Auto Shutdown Pro II is an automation launcher for scheduling of multiple tasks to shutdown, hibernate, sleep your computer simultaneously based on time, duration of use, busy or idle CPU, heat, and with mobile computers battery charge available in 54 languages with internal tutorials. Hi. I am the author of Auto Shutdown Pro. The negative claims of whoever "Freeware Watchdog" is, are NOT TRUE. My program DOES NOT ask for an access code. The program DOES NOT ask for your name and email address. I don't know what this individual's personal problems are, but what is claimed here about my program are NOT TRUE. Download my program. Install it. You will find out that nothing reported here is true of my program. Possibly whoever this fellow is he got my program confused with someone else. Let's hope his problems are not serious. All of the "reviews" so far are from the program author! "When you install the program and run it the first time, it asks for an access code. To gain it you have to enter your name and email address. Then an access code is sent you. But what I get from that is their name, email address, their machine name, their country code, their language preference, the operating system they are running, whether their running a 32 bit or 64 bit operating system, and of course the date and time they installed the program. And if someone uninstalls the program, I even then know when they uninstall, how many hours and days the program has been on their machine, whether they actually used the program, and automatically then I send them a thank you." Auto Shutdown Free, a freeware program, and Auto Shutdown Pro II, shareware program. Both are computer management utilities by the same manufacturer that will double the life expectancy of a computer while saving electricity. Both handles shutdowns, sleeps, power on, restarts, log offs, locks, hibernation or turning off the monitor. The system will launches or terminates programs, opens files or URLs. Scheduled triggers are time, duration as a countdown of time, idle, or power. Both programs are essentially 85% the same. The Free version has five less features than the Pro version: (1) Action Schedules, (2) Blocked Time, (3) Busy Shutdown, (4) Heat Shutdown, and (5) Program Launching. These 5 features are only available in the Pro version, and in no other shutdown program in the world. The Free version however has more features than any other shutdown program in the world, including the shareware products that would otherwise cost you money. Blocked Time, a feature in only the Pro version, may well be a feature of sufficient value for many users to eventually justify purchasing the additional licensing to upgrade the Free version to Pro version. With Blocked Time you can set "blocks" of times that you don't want the computer to be used by anyone. You can set morning block time and evening block time, and in each one define the start and end time that you want this feature to prevent your computer from running. Even if someone turns on the computer during those hours, even with the computer’s password, Blocked Time will shut down your computer immediately after Windows starts. This serves as a Parental Control to keep your kids off the computer past their bedtime, and as a security feature to protect confidential documents from theft while you are away from your computer. It is also possible to have the program shutdown the computer if you set a timer, a stopwatch, or by checking the CPU usage. Overheating and low battery levels are another event where Auto Shutdown can shut down your computer too. Other kinds of scheduled actions can be performed too: you can launch or terminate a program, open a file or a URL, or display a custom message. All these events can be scheduled either by using the Timer or the Duration method. The “Pro” for Auto Shutdown Free users is that they have a clear ability to upgrade at any time. If a user installs the Pro version but then does not purchase a license during the 30 day trial, the Pro version then simply gracefully degrades to Auto Shutdown Free and continues working. The point is, users will no longer be forced into accepting some other manufacturer’s second rate shutdown program with far less features, because now you get the same high level quality, support, and most of the features with the Auto Shutdown Free, the freeware version, that was earlier only available in Auto Shutdown Pro II. The effort made by this application's developer is enormous, and it really paid off. Neither program have cons, in terms of being programs. Both programs are highly polished. The initial small installer examines your computer to determine whether the CPU is 32 or 64 bit, and what version of Windows you are running; the actual install program and needed libraries for both varies based upon your computer's setup. The first small install programs for either version then queues up the precise main install program and libraries needed for your computer, and begins to download them. The “con” of either version is that these secondary downloads will take likely 12 to 15 minutes. These programs are actually a very serious unified comprehensive system that enables you to intelligently minimize computer wear and tear, expense and electricity. If your time is so priceless that you don’t have the patience to download a high quality program that will save you real money, then neither Auto Shutdown programs are for you. If "saving" is your goal, then either the Pro of Free version are the only programs you need consider. The "con" thus is the time required for the total download. If you pay that price and use either of these two systems then the result is a priceless automation system for your computer. Auto Shutdown Pro II and Auto Shutdown Free are very serious highly polished computer systems which enables users to minimize wear and tear on their computers, save electricity, and thus gain both a capital and operational financially savings which in time will far exceed the cost of the computers themselves. There is no learning curve for either programs operation because both programs have a self-passed tutorial that guides your precisely, step by step, as to which options to use and why. A human voice actually advises you what to do. The program is simple to use, and elegantly designed. Both programs can be run in any of 66 different languages, which entails 98.4% of the world's literate population. The voice which advises you as you run these programs is always in English. But if you are running either the Pro or Free program in a language other than English, there appears simultaneously the same tutorial in that alternate language much as you would expect subtitles for a movie. These are a global program to solve an operational problem common to all computers: PC, laptops, and notebooks. These programs themselves are an automation shutdown launcher utility. Is this a shutdown program? Yes, but it does a lot more than merely act as a shutdown program. 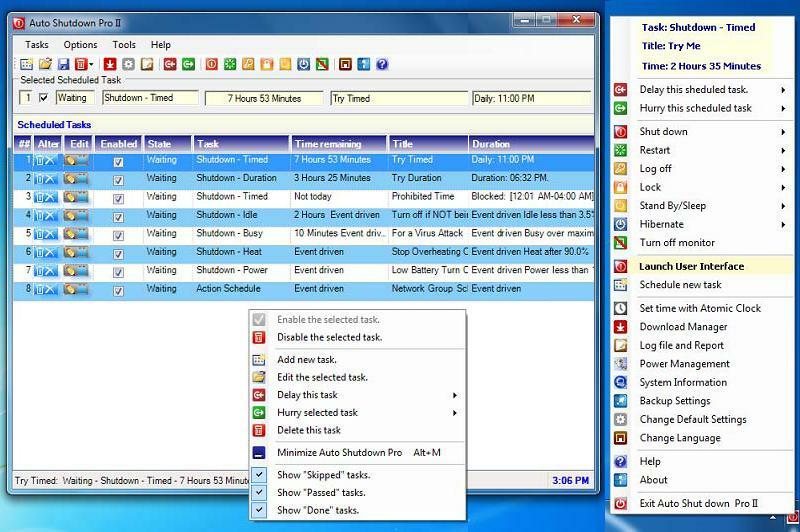 Auto Shutdown Pro II and Auto Shutdown Free have really extended functionality and can be used for various purposes. Both also look out for your computer's safety in several ways, and makes sure that your computer will remain turned off when it should be. This program if applied will double the life expectancy of your computer. A 300 watt computer over a 10 year period can expect $4300 in savings, far beyond the actual cost of the computer. Saving are both (a) capital costs for not having to replace the computer, (b) maintenance costs for delaying the need to replace component parts of the computer, and (c) electrical costs through a management that reduces to the minimum time when the computer would otherwise be left on and no-one is using it. The programming is done to the highest standards. The program is capable of being used in 54 different languages, such that 96% of the world's population can use this program in their own native language.